Canada Goose Removal - Information about the humane trapping and removal of Canadian gooses. These are generally fine birds, except for the fact that they are large, they flock in large numbers, and they leave behind a lot of goose droppings. They can completely befoul an area! They also scratch at lawns, damaging them. But the real problem is the large amounts of goose poop everywhere. Pooping all over the place. They can leave thousands of large, unsightly, and smelly droppings all over a property. Scratching and tearing up a lawn or other landscaped area. They honk loudly, and can make a lot of noise, which some people don't like. The droppings can befoul waterways, and make water unclean. Sometimes they will poo in a swimming pool, on a concrete sidewalk, etc. A Canada goose is a wild goose with a black head and neck and brownish grey body. It also has white colored patches on the face. They are large birds and can grow up to 50 inches in length with a wing span of up to 68 inches. Canada geese like to eat aquatic vegetation, roots, grass, young sprouts, grain and corn. The males are slightly larger in size then the females and are heavier and a lot more aggressive. For eating, they hold a blade of grass in their beak and tear it off with a jerk of their heads. They are also good swimmers. For a period starting from mid-June until around the end of August, Canada geese go through the molting process. During this period they lose their outer wing feathers which prevent them from being able to fly for eight to 10 weeks. During this time, they gather at a pond or lake which provides a safe place for them while they are landlocked. Those who do not have babies or goslings fly hundreds of miles to reach areas which are safe while they are molting and spend their time there while their feathers grow back. Canada geese are a native of North America and are found in abundance in Canada and northern parts of the USA. They make their nests at elevated places close to a water source such as ponds, rivers or lakes. The eggs are laid in shallow depressions and are covered completely with leaves and other plant materials. They prefer to stay around places with a lot of open fields as it aids them in detecting the presence of any predators in the area and gives them an opportunity to escape if one enters the surroundings. As the winter approaches, they migrate to warmer climatic areas of northern Mexico and then return back when conditions are favorable. Canada geese usually mate during the second year of their life. They choose a partner and stay together until one passes on. When one of the mated partners dies, the other will likely find a new partner to continue in life. Canada geese lay three to eight eggs at a time and the nest is protected by both goose and gander (the male goose). Both parents take turns hatching the eggs; however the goose will spend more time in the nest than the gander. The goslings take 24 to 28 days to hatch. It is during this time that molting occurs and adults lose their feathers. They start to fly again at the same time as young goslings begin to learn how to fly. Adult geese lead the goslings to different places as they walk in a line with one parent in front, another at the back and the goslings in between. In case they find any kind of threat to their gosling, they make a hissing sound to ward off other animals. If the threat still remains they violently chase it away while slapping the animal (or human) with their wings as well as pecking at them with their strong beaks. Though usually hostile to unfamiliar geese, they sometimes form alliances with other adult geese to aid in protecting the goslings. Canada geese carry infections of a few diseases which can transfer to humans. Swimmer’s itch is a parasite on these geese which is transferred via water sources such as swimming pools and causes those infected to have skin irritations. They also cause a disease called histoplasmosis which results in mild influenza to fever and even death. 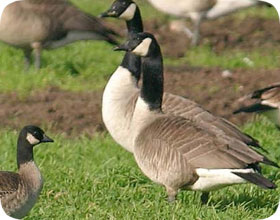 Toxoplasmosis is another disease humans can catch from Canada geese which damages the nervous system. Canada geese are a big cause of destruction of vegetation especially during their molting period. They can be a noise nuisance as they loudly squawk and flap their wings. Their growing population in an area leaves behind a lot of urine and droppings which are not only annoying, but can lead to illness and disease in humans and pets. Around small pets, Canada geese may become protective and even dangerous as they attack cats and dogs that they might see as a threat or that they might feel are encroaching upon their territory.